Discover Rwanda has moved to a new location in Kimihurura. The map at the bottom of this article is accurate but the post and photos still need to be updated which will happen when I get a chance to visit them… hopefully soon. 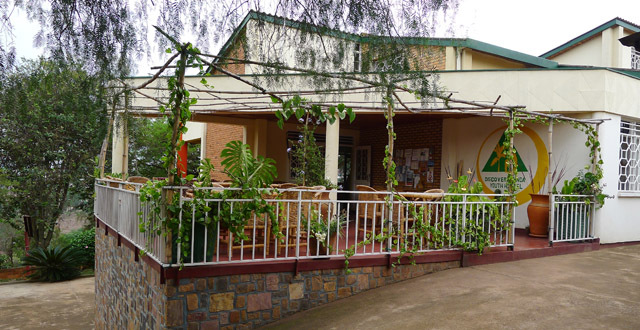 Originally started as a social enterprise for the British organization Aegis, the Discover Rwanda Youth Hostel has cleverly filled a niche in the Rwandan tourism market. There really are no other budget options in Kigali with a laid back backpacker atmosphere. It’s Rwanda’s first hostel and it does a great job in offering a chilled out place to lay down your backpack or to stay for awhile while you look for more permanent Kigali digs. Besides St. Paul’s Hostel in town, this is by far the cheapest option. But it really it’s the only option because, lets face it, nuns are scary. It is great to see that the very first hostel in Rwanda has been set up and is run in a way that is inviting to independent travellers. The gated three-story building is located in Kacyiru, a fairly calm area of town where you also find several hotels, NGO and UN offices, the Kigali Business Center (KBC), and the US Embassy. In close proximity to the hostel are also a couple of cute coffee shops (with free wifi), an ATM for international Visa cards (which, trust me, can be hard to come by in Kigali), and a casino. Oh, and at KBC you also find Planet Club, perfect for tacky late-night dancing worthy of any self-respecting backpacker. I was given a tour by the manager Uwera Egidia, a young cheerful Rwandan woman who started working at Discover Rwanda as a receptionist a year ago. She explained that they have a mixed group of clients, ranging from young backpackers to bigger tour groups. 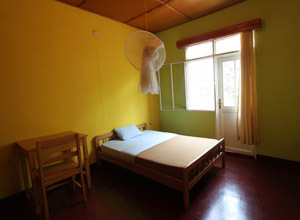 The hostel has also become a popular choice for Rwandan conferences such as teacher’s retreats and other local seminars. The rooms are well kept and clean, and the bathrooms are some of the best I’ve seen while I’ve lived here – including most of the expat houses I’ve been to. There is hot water, and according to Uwera they have yet to experience problems with the water being shut off. Unlike St. Paul’s policy on roaches (‘all creatures of God are welcome to use the beds and bathrooms’), Discover Rwanda youth hostel are largely void of bugs and critters and they spray regularely to keep it this way. Yay! Besides cozy rooms and hygienic toilets, there are a few additional perks with staying at this low-budget establishment. A humble internet café is in its starting phase, as is a kitchen available for customers to use. 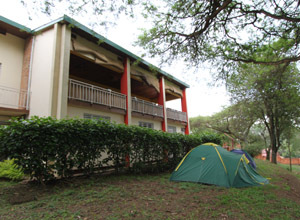 There are several comfortable seating areas scattered around the main floor, and a spacious balcony with amazing views over the Nyarutarama lake and forestry areas. 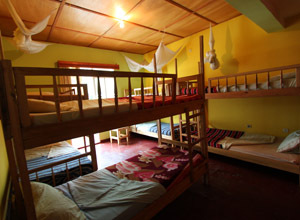 The wooden beds are sturdy and come equipped with mosquito nets. The garden is currently being leveled for a future campsite and fire pit that will be able to accommodation large overlanding groups. There are currently some grassy areas here and camping is welcome making it one of the few places in town to pitch your tent unless you have a nice friend with some space in their backyard. Other projects in the wings are movie nights, karaoke, and dragon flying courses. …yeah, so okay, two out of three, but still not bad. For you socially responsible souls out there, Discover Rwanda has yet more to offer. 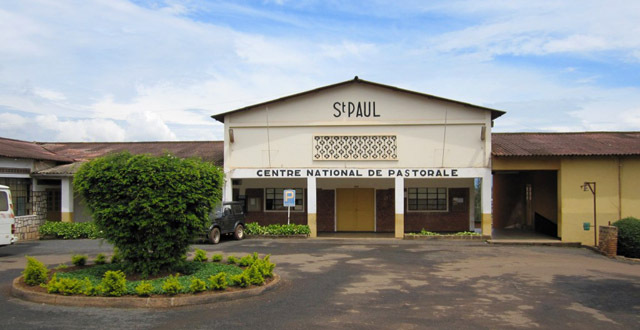 As mentioned in the introduction, the hostel is run by the Aegis Trust, a British Organisation that helps manage the Genocide Memorial here in Kigali and also champions the prevention of genocide worldwide. They have been in Rwanda since 2000, and have worked closely with the Rwandan government in developing the Memorial. After years of hosting educational student trips to the country and having to put the students up in other accommodation, Aegis thought it could be a good idea to start the hostel. They have also begun to brainstorm more sustainable ways to continue to raise funds and help the local community. Though obviously striving to provide an affordable place to stay for travellers Aegis also hopes to use the hostel to give Rwandans an opportunity for professional development and vocational training. Most of the staff at Aegis’ enterprises (the youth hostel included) are offered thorough training and professional experience, before being encouraged to seek employment in other companies and establishments. From what I saw when visiting the hostel, the staff seemed motivated and energetic, which is more than you can say about many other guesthouses and low-budget hotels in Kigali. This is the bathroom. I like it so much. Only I wish the tiles were green. Then we would have the colors of Rwanda. 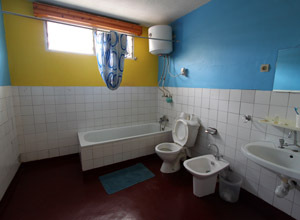 And if there is something I like more than bathrooms, it’s Rwanda. To make a booking give them a call on +250 (0)78 226 5679 or head over to Hostelworld to book online. i’m french and i go to kigali in february. i will want sleep in a Youth Hostel. can i have the numero or adress of this Youth Hostel ? thank you very much for your information and scuse me for my bad english !! I’ve just added their phone number to the bottom of the post, so give them a call. Or you can go to http://www.hostelworld.com and reserve online. Once I get their email address, I’ll add it as well. There aren’t really addresses in Kigali but it’s behind Great Wall Chinese restaurant which is across the road from Top Tower Hotel. Have fun! It’s a cool place. I would also be very interested in an email adress? did you happen to get it? Want to inquire about a long term camping stay there (> a month). Don’t really want to book tht using a third party.